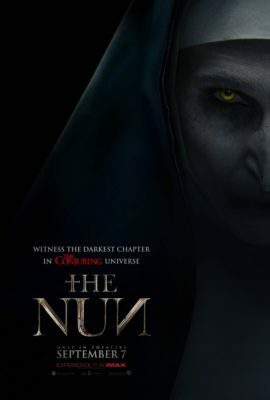 The Nun is a generic slugfest of a film that has interesting concepts, but loses interest for so long that it never really retrieves it. The movie is about a priest and a nun who have to investigate a church after an incident regarding the nuns stationed there. The plot centres around whether or not the land that is there is still deemed holy enough to re-open the church. The movie is very slow paced, with one jump scare after another coming at you with nothing really interesting connecting them together. It becomes so bad that you’re really counting them down as they come, adding to the concept that the movie didn’t really know what it wanted to be. The fear factor created by the poster of The Nun is far scarier than the actual nuns themselves, taking away from any long-lasting fear it may have and diminishing it into short-turn jump scares. That message becomes more than clear by the third act where it just turns into a supernatural action film, which definitely was a plus. It drops the entire dramatic facade it was attempting to carry and goes head first into a more action-centred plot. However, by the end, the entire journey feels contrived and pointless, with no real payoff that makes it worthwhile. With the exception of one small change to the life of the nun, in general, it feels as if this entire experience didn’t have really any long-lasting effects on anybody. A more character centred story could be very interesting, with examples like Castaway or the Revenant. However, The Nun never really picks whom the journey is centred around, which makes an audience member feel confused about who the events are really effecting. The setting is engaging, though it never feels utilized and has the side effect of the events not mattering in the long-run. The characters are somewhat generic, with the one interesting, redeemable character being the man Frenchie. This gentlemen either knew this film wasn’t going to be good or he just wanted to give it his all, but he steals every scene he’s in with his charm and his charisma. Another flaw with the film is the leaps that these characters take in order to solve these conflicts. More than once, they make decisions that don’t have any motive or reasoning. Decisions in films need to be made with logic, reason, or experience, yet in The Nun, they just decide to do something and it magically works for them. No logic, just luck. A positive on the other hand is the connection that it has to The Conjuring series as a whole. The film is a prequel to the movies in general, but there isn’t anything that you need to know going in. Overall, the movie does attempt to be engaging though it falls short, having the audience sit through the first three quarters with predictable scares, not that engaging characters (with the exception of the adorable Frenchie) and a pace that leaves it very forgettable.